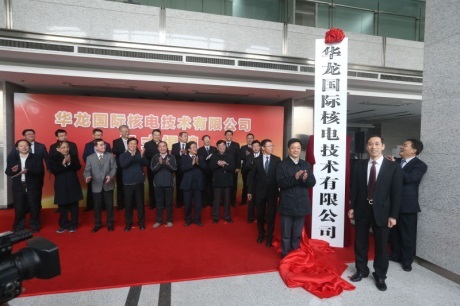 Hualong International Nuclear Power Technology - the joint venture between China General Nuclear (CGN) and China National Nuclear Corporation (CNNC) to promote the Hualong One reactor design in export markets - was officially inaugurated today. In 2012 central planners in Beijing directed CNNC and CGN to 'rationalise' their reactor programs. This meant CNNC's ACP1000 and CGN's ACPR1000 were 'merged' into one standardised design - the Hualong One. In late December last year, CGN and CNNC announced that they had agreed to create a 50-50 joint venture to promote China's "third-generation" nuclear reactor design, Hualong One, in overseas markets. At that time, the two companies signed the shareholder contribution agreement and the articles of association for creating Hualong International. The agreement to form the Hualong company followed the two companies' signing of a "technology integration agreement" in August 2015. In separate statements today, the two companies said the joint venture had now officially begun operating. They said that since December, Hualong International had completed industrial and commercial registration in Beijing. Also, CGN's Zou Yongping has been appointed chairman of the new company, while CNNC's Xu Pengfei will be its general manager. Meanwhile, CGN and CNNC have been working on integrating their technologies into the export model of the Hualong One. Hualong International will "actively implement" China's nuclear power development strategy, which is "committed to the continued integration and development of Hualong One as an independent third-generation nuclear power technology, with the unified management of the Hualong brand, intellectual property and other related assets at home and abroad", CGN and CNNC said. The company will promote Hualong One as the Chinese nuclear power industry's "flagship brand". Construction of two Hualong One units is already under way at CNNC's Fuqing plant in Fujian province, as well as the first of two such units at CGN's Fangchenggang plant in Guangxi province. Although it is still officially listed as being ACP1000, Pakistan's Karachi Coastal Power station is likely to be the first export of Hualong One units. Under the Strategic Investment Agreement signed last October, CGN agreed to take a 33.5% stake in the Hinkley Point C project in Somerset, England as well as jointly develop new nuclear power plants at Sizewell in Suffolk and Bradwell in Essex. The Hinkley Point C and Sizewell C plants will be based on France's EPR reactor technology, while the new plant at Bradwell will feature the Hualong One design. As part of that agreement, CGN agreed to form a joint venture company with EDF Energy to seek regulatory approval for a UK version of the Hualong One design. The following month, China and Argentina signed an agreement to build a Hualong One reactor as the South American country's fifth nuclear power unit.